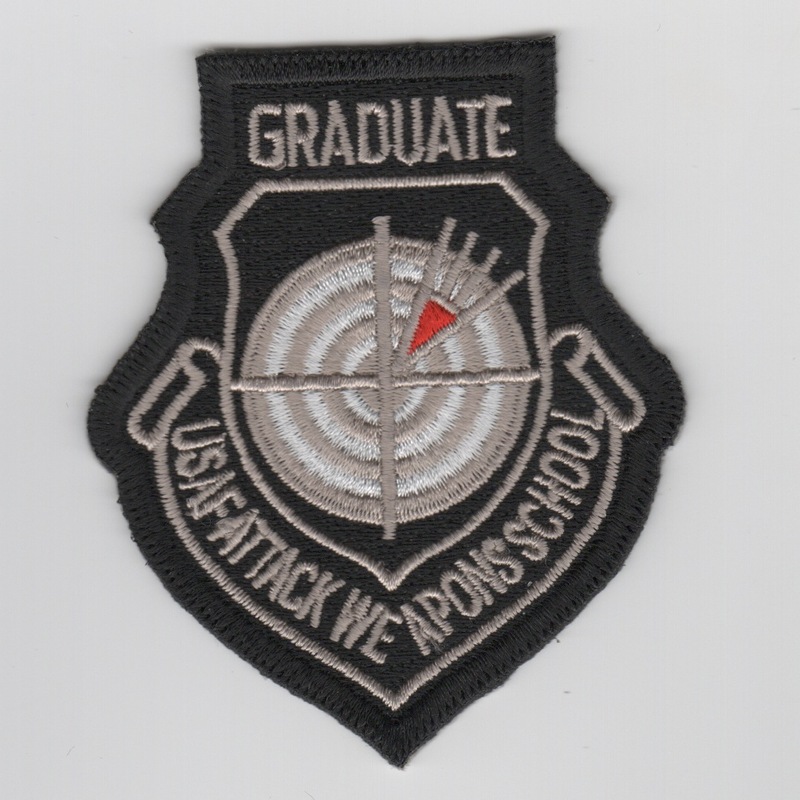 This is the USAF "ATTACK" Weapons School GRADUATE patch worn on the flightsuit. This patch does NOT have velcro attached. I can include some if you need. 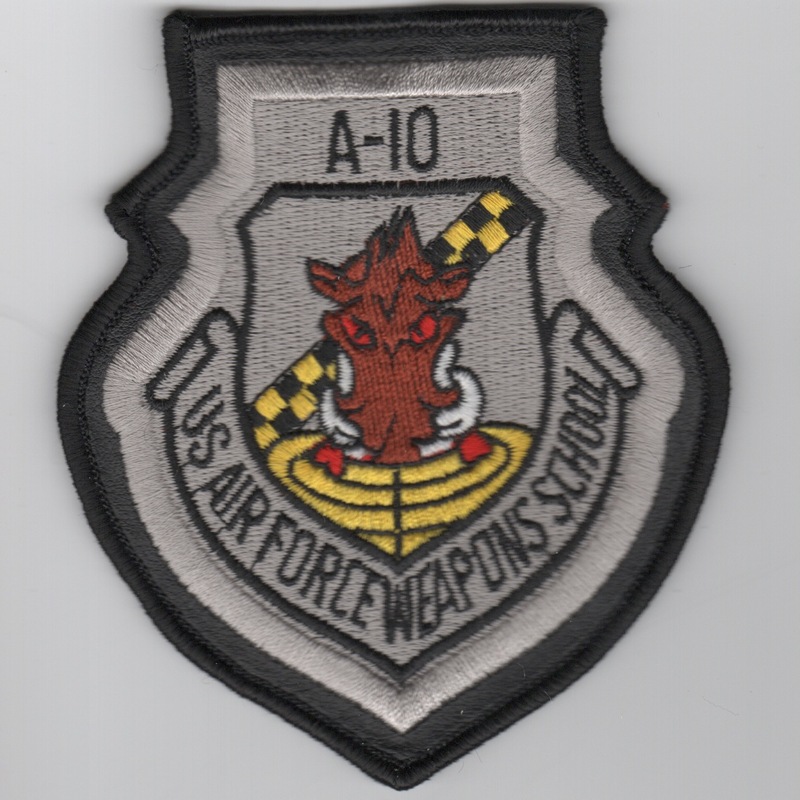 This is the leather-bordered version of the USAF Weapons School A-10 Division patch worn on the leather flight jacket. It shows the "Warthog" in the center of the patch. This patch does NOT have velcro attached. I can include some if you need. This is the 10th anniversary patch from the Weapons School for the B-1, the USAF's hardest, but best school. This is definitely a collector's item, as I could only get a few. This is another of the AV8RSTUFF creations for the 77th Weapons School Squadron. It is the 25th anniversary patch for the B-1 created using the latest technology "sublimation" style. This is definitely a collector's item and does not come with velcro attached. 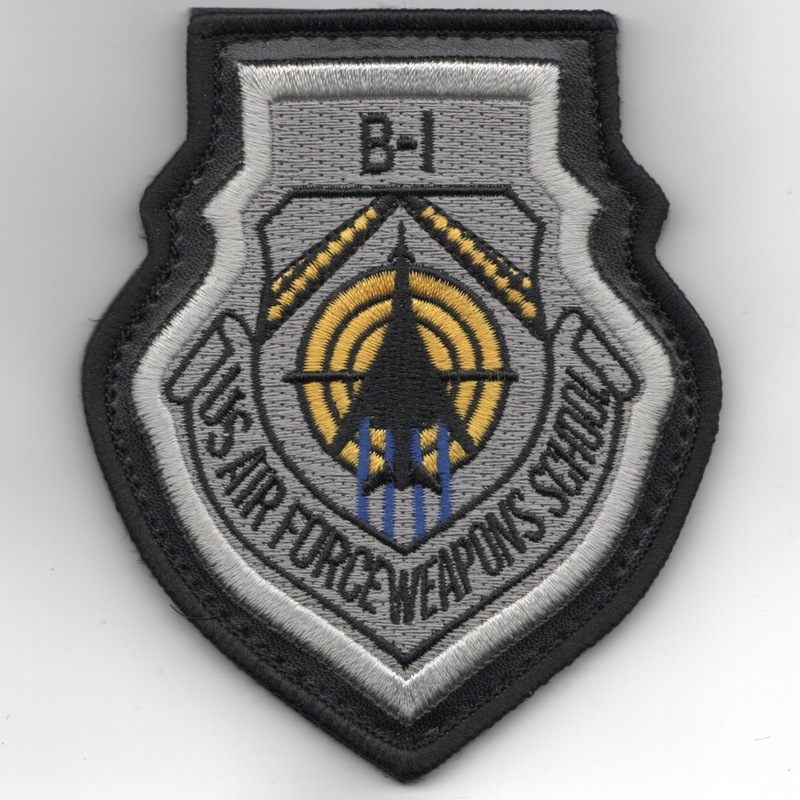 This is the leather-bordered version of the USAF Weapons School B-1B Division patch worn on the leather flight jacket. It shows the "Lancer Planform" in the center of the patch. This patch does NOT have velcro attached. I can include some if you need. 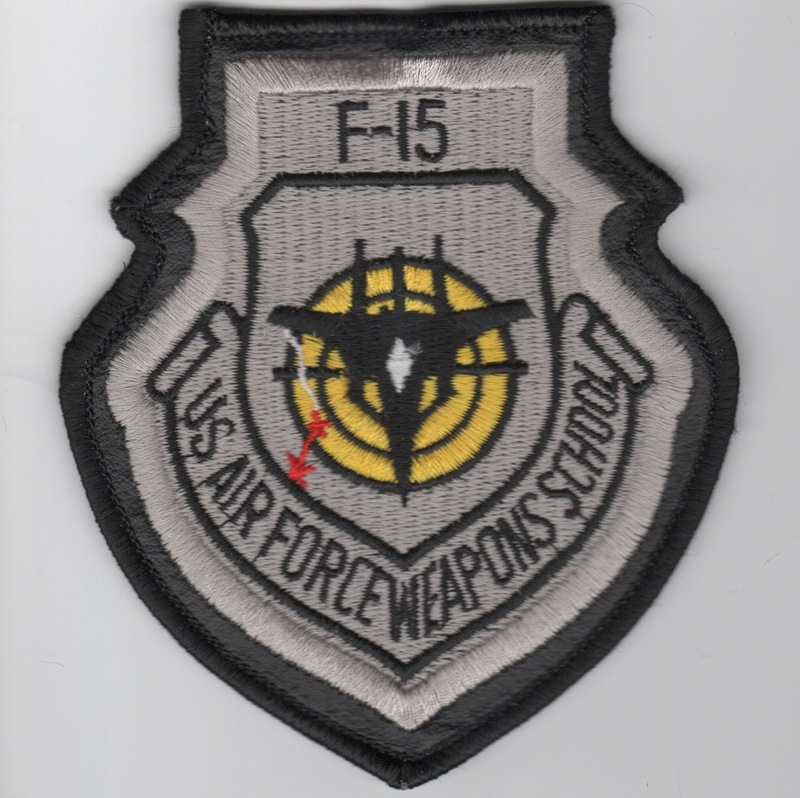 This is the leather-bordered version of the USAF Weapons School F-15 Division patch worn on the leather flight jacket. It shows the front view of the "Eagle" in the center of the patch. This patch does NOT have velcro attached. I can include some if you need. 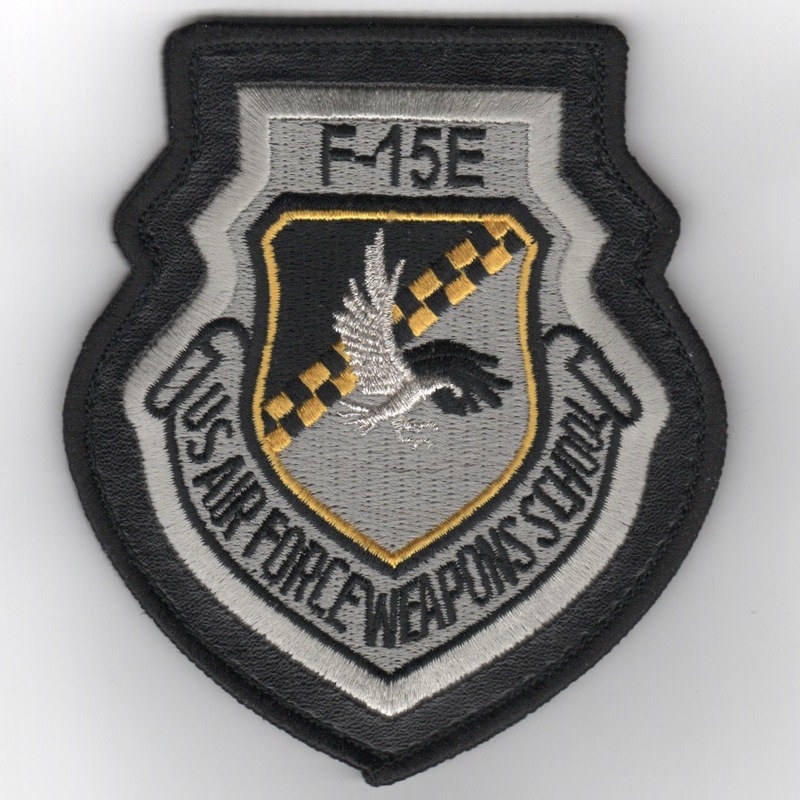 This is the leather-bordered version of the USAF Weapons School F-15E Division patch worn on the leather flight jacket. It shows the side view of the "Eagle" in the center of the patch. This patch does have velcro attached. 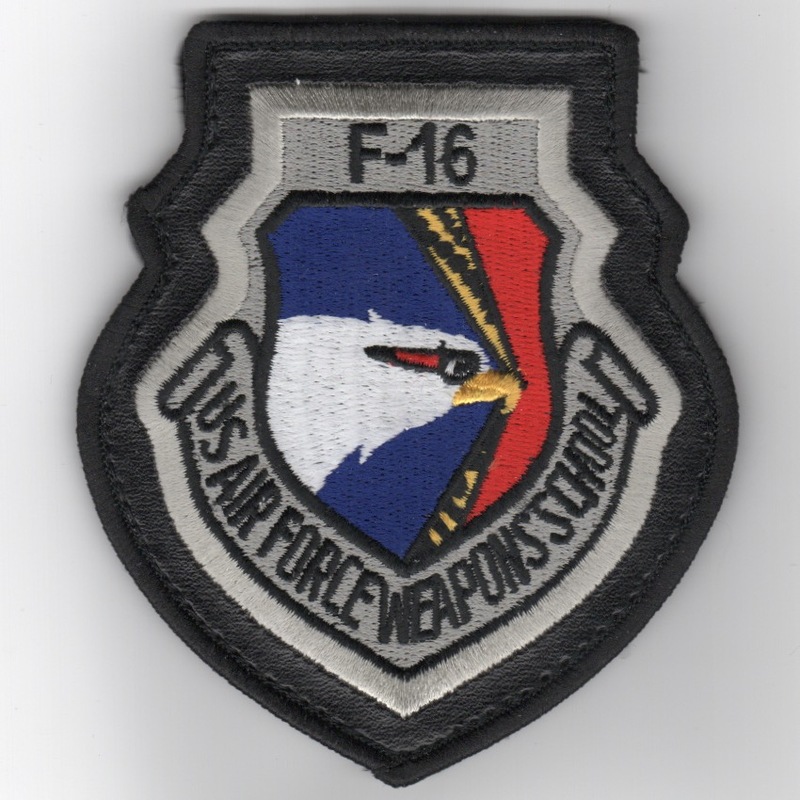 This is the leather-bordered version of the USAF Weapons School F-16 Division patch worn on the leather flight jacket. It shows the side view of the "Falcon-head" in the center of the patch. This patch does have velcro attached. 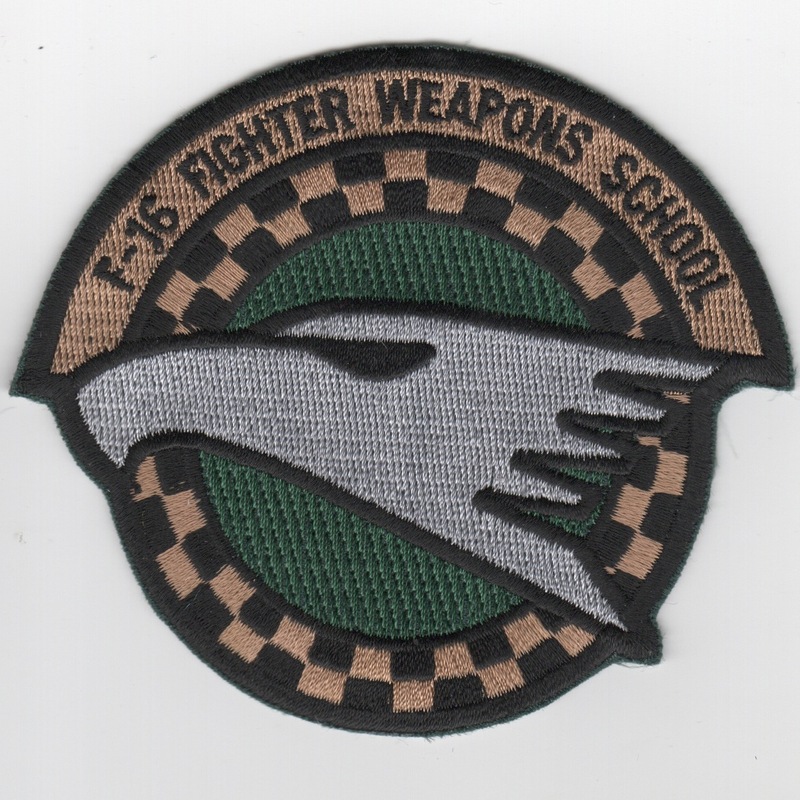 This is the green version of the USAF FIGHTER Weapons School F-16 Division patch worn on the flightsuits. It shows the side view of the "Falcon-head" in the center of the patch. This patch does NOT have velcro attached. I can include some if you need. This is the leather-bordered version of the USAF Weapons School 'Command & Control' (CCO) Division patch worn on the leather flight jacket. 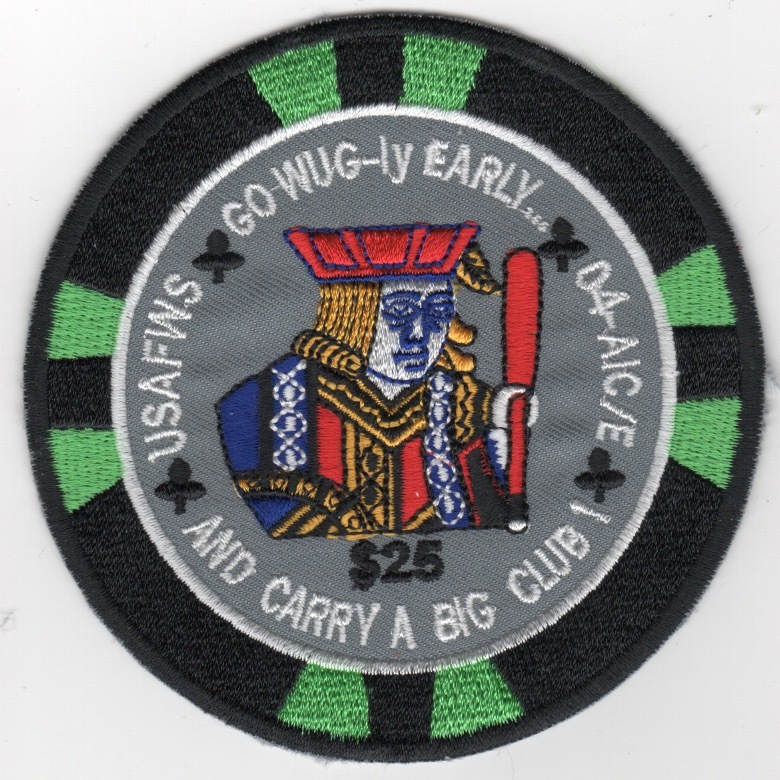 It shows the ABM symbol in the center of the patch. This patch does NOT have velcro attached. I can include some if you need. 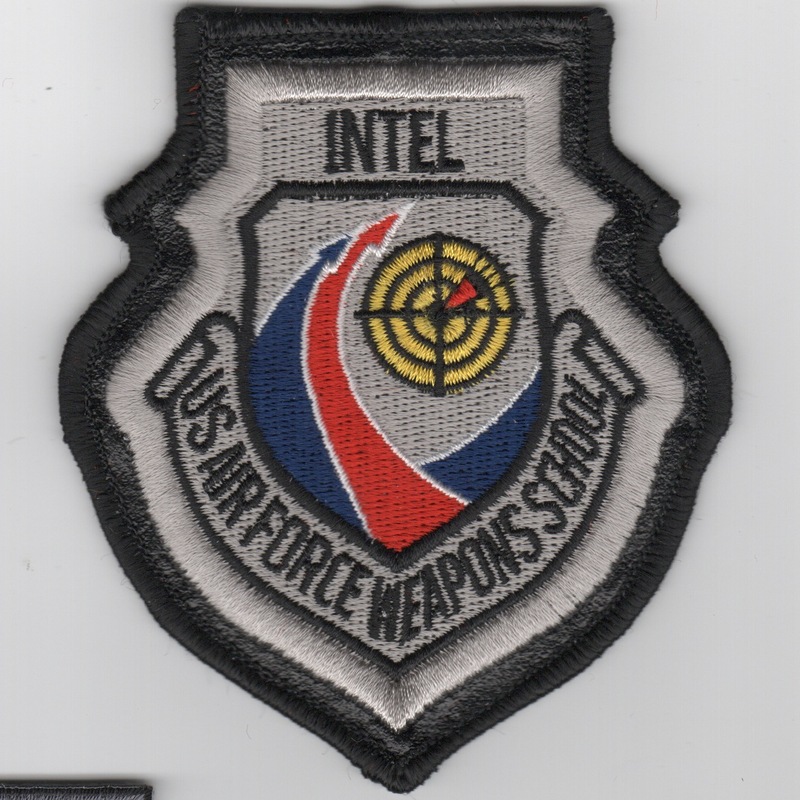 This is the leather-bordered version of the USAF Weapons School 'Intelligence' (INTEL) Division patch worn on the leather flight jacket. It shows the aircraft "swirl" in the center of the patch. This patch does NOT have velcro attached. I can include some if you need. 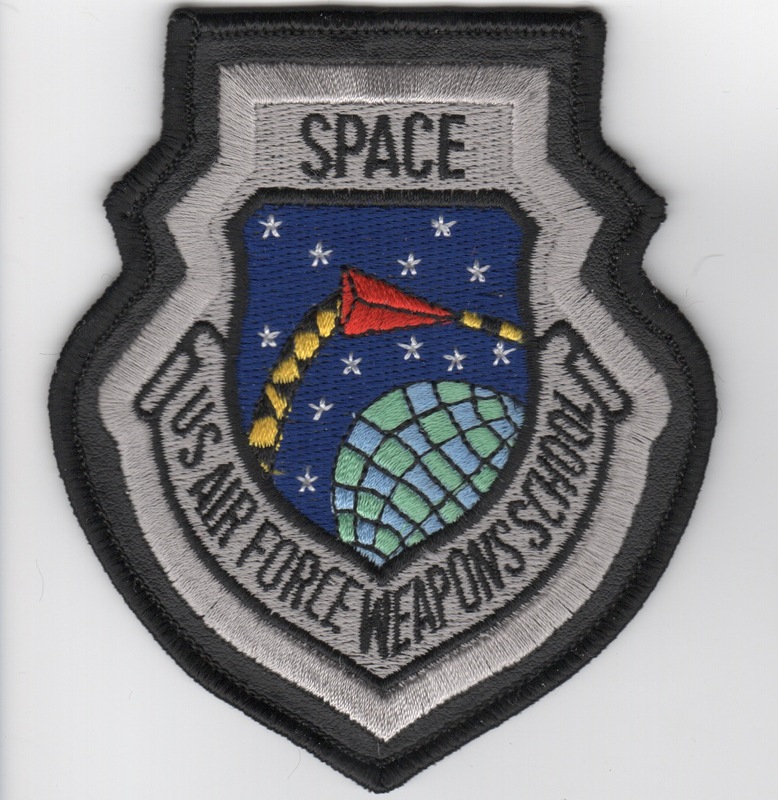 This is the leather-bordered version of the USAF Weapons School 'SPACE' Division patch worn on the leather flight jacket. It shows the "aircraft in orbit" in the center of the patch. This patch does NOT have velcro attached. I can include some if you need. 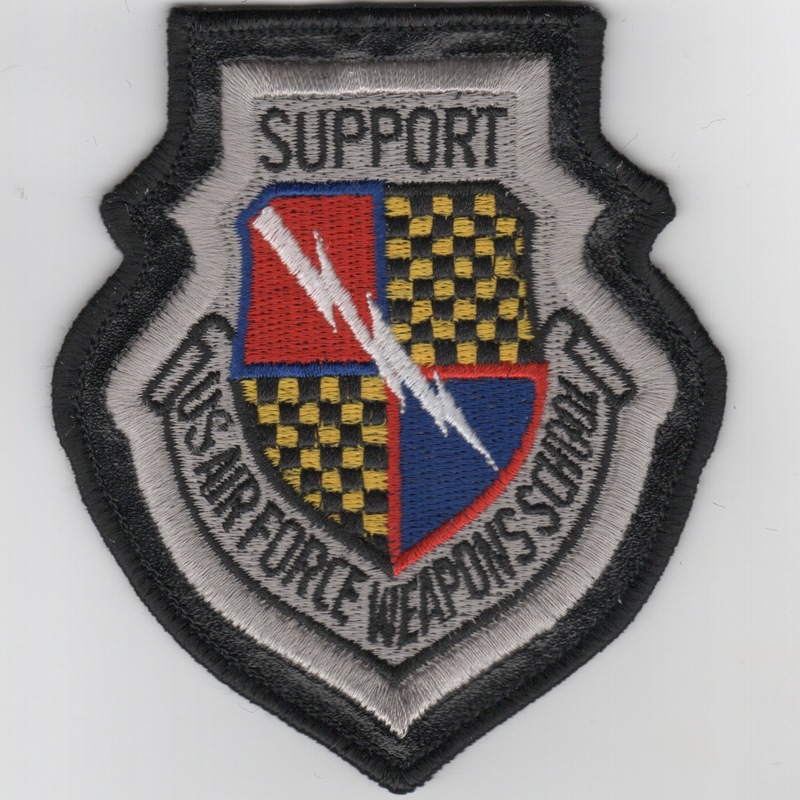 This is the leather-bordered version of the USAF Weapons School 'SUPPORT' Division patch worn on the leather flight jacket. It shows a white lightning bolt in the center of the patch. This patch does NOT have velcro attached. I can include some if you need. 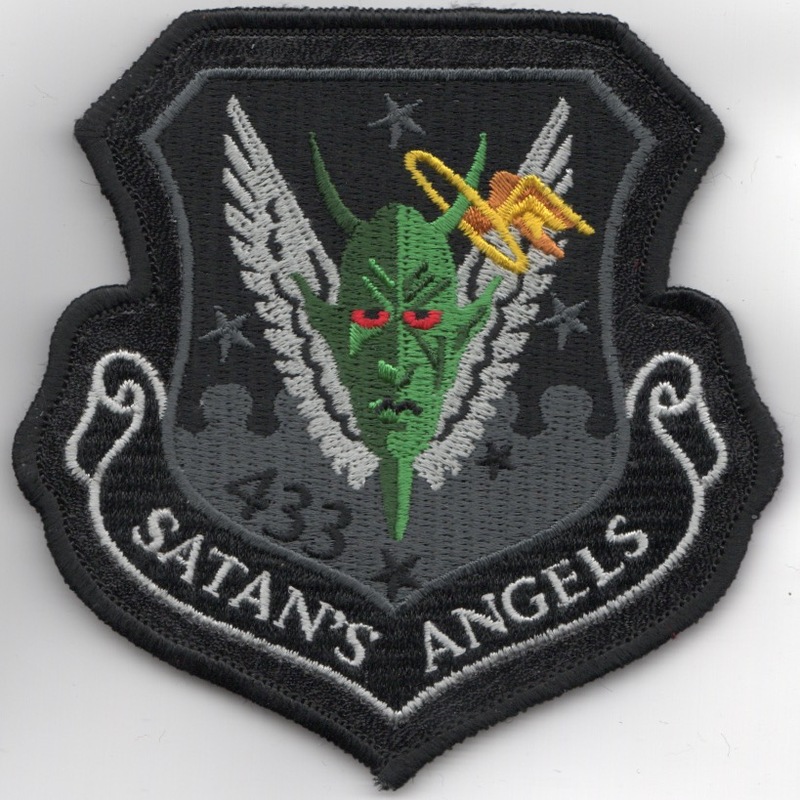 The 433d Weapons Squadron (433WS) is a USAF unit, assigned to the USAF Weapons School at Nellis AFB, NV. The unit was first activated in May 1943 and flew the P-38 Lightning in the Pacific Theater of Operations. The 433d distinguished themselves in air combat against Japan over New Guinea, Rabaul, and the Philippines, achieving over 200 aerial victories. Reactivated in 1964 for the war in Southeast Asia, the 433d was assigned to the 8th Fighter Wing at Ubon, Thailand, flying the F-4 Phantom II. The 433d was credited with 12 MiG kills over North Vietnam. 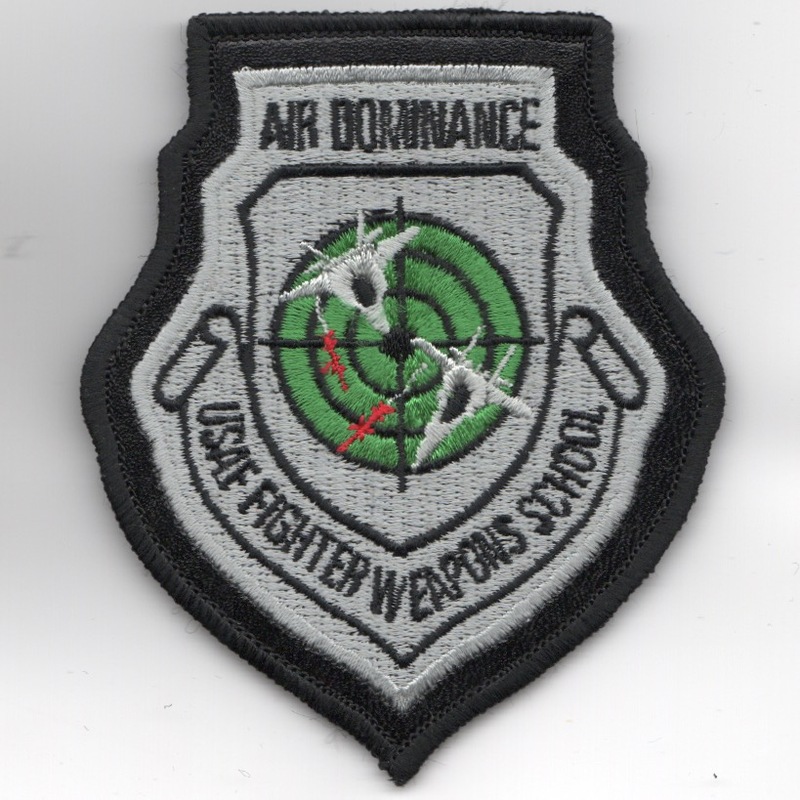 This patch says "AIR DOMINANCE" (top) and "USAF FIGHTER WEAPONS SCHOOL" (bottom), and has the "leather" border and velcro. The 433d Weapons Squadron (433WS) is a USAF unit, assigned to the USAF Weapons School at Nellis AFB, NV. The unit was first activated in May 1943 and flew the P-38 Lightning in the Pacific Theater of Operations. The 433d distinguished themselves in air combat against Japan over New Guinea, Rabaul, and the Philippines, achieving over 200 aerial victories. Reactivated in 1964 for the war in Southeast Asia, the 433d was assigned to the 8th Fighter Wing at Ubon, Thailand, flying the F-4 Phantom II. The 433d was credited with 12 MiG kills over North Vietnam. This patch says "SATANS ANGELS" (bottom), and has the "leather" border and velcro. 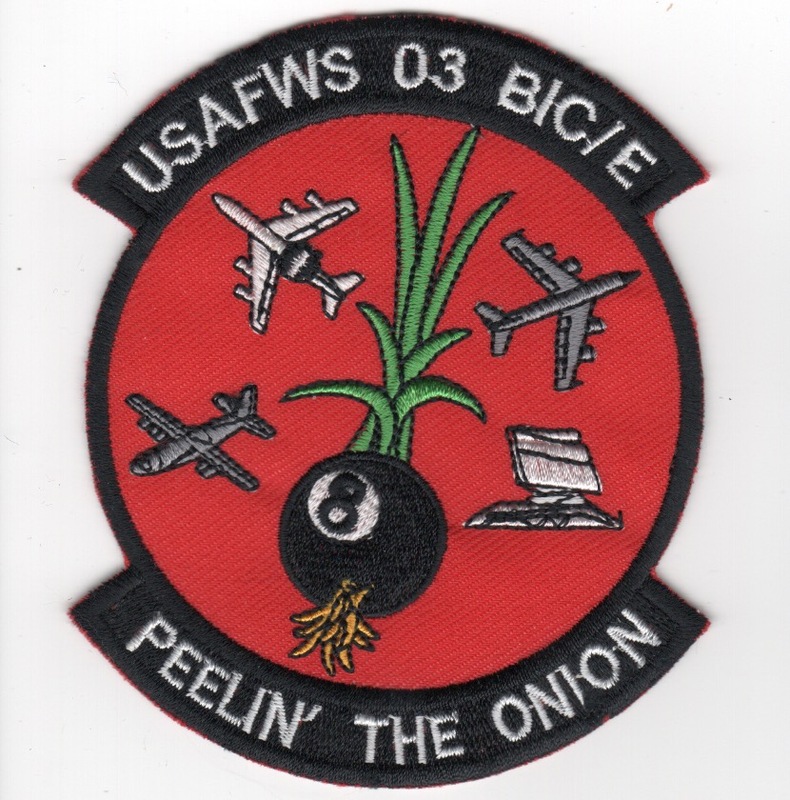 This is the color version of the 435th FS's "Smurf" Weapons School GRADUATE patch and shows the BDU-33 practice bomb landing "off-target". This patch is for the T-38 drivers at Holloman AFB, NM. 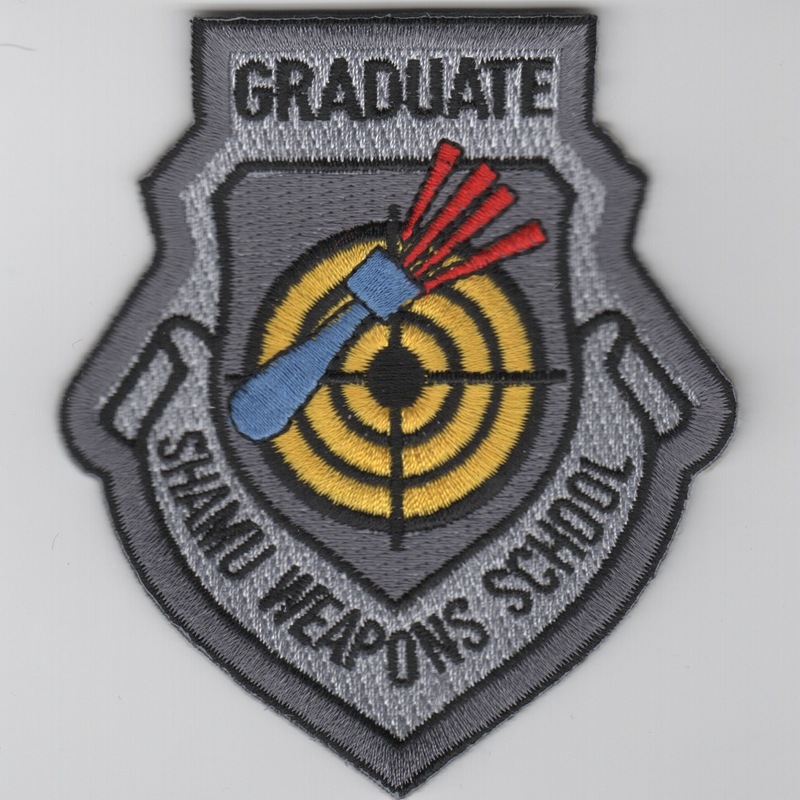 This is the SHAMU Weapons School patch for the AT-38 patch design borrowed from the 435 FS Smurf Wpns school patch done for the 97 FTS at Sheppard. "Shamu" reflects the new paint scheme for the AT-38 in two-tone grey which will go on all T-38's over the next few years. This patch does NOT have velcro attached. I can include some if you need. This is the class patch for 'Class 03 BIC/E' that attended the US Air Force Weapons School (WIC) course at Nellis AFB, NV. It says "PEELIN THE ONION' and does not have velcro attached. This is the class patch for 'Class 04 AIC/E' that attended the US Air Force Weapons School (WIC) course at Nellis AFB, NV. It says "GO WUG-LY EARLY' and does not have velcro attached. 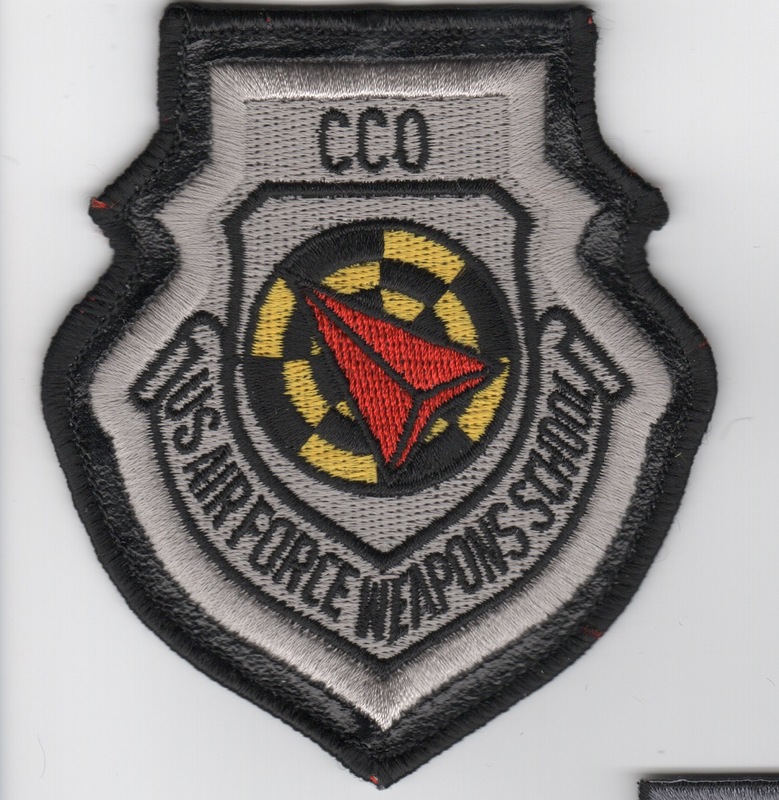 This is the class patch for 'Class 06A' that attended the US Air Force Weapons School (WIC) course at Nellis AFB, NV. It says "KNOW YOUR ENEMIES' and does not have velcro attached. 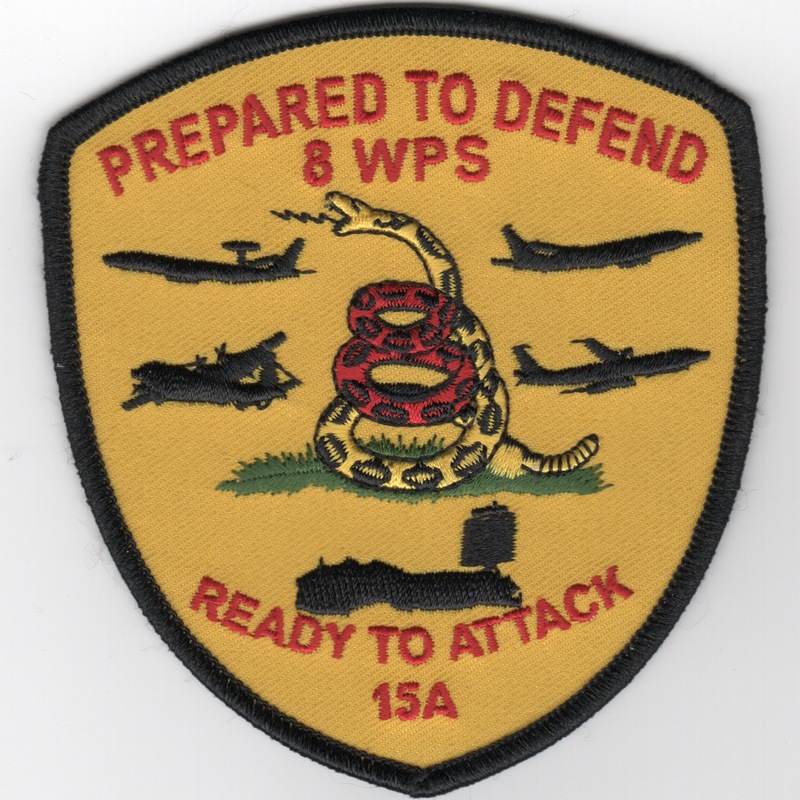 This is the class patch for class 11B that attended the US Air Force Weapons School (WIC) course at Nellis AFB, NV. 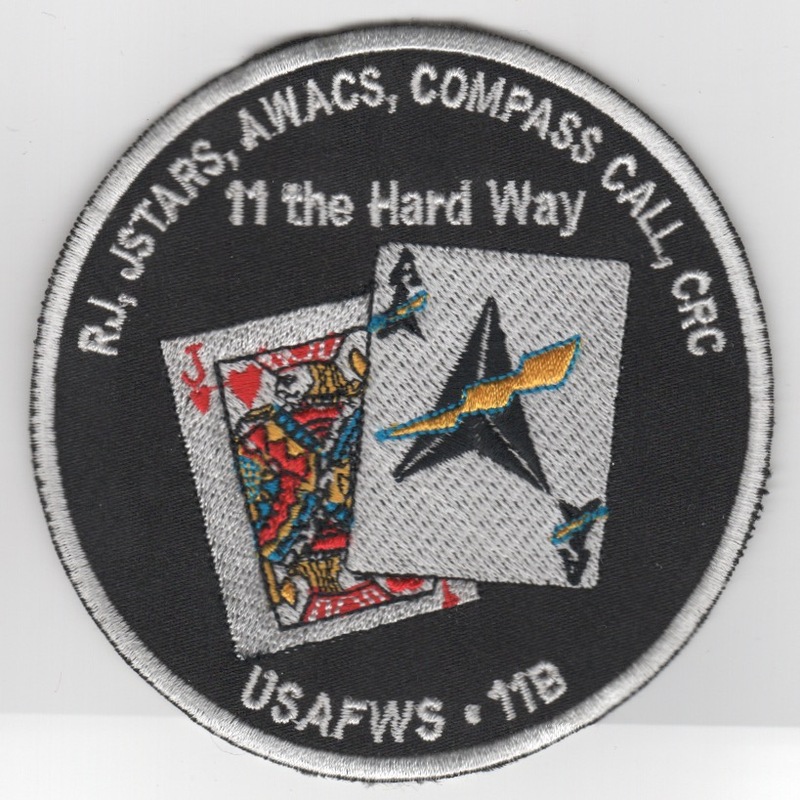 This patch says "11 THE HARD WAY' and does not have velcro attached. 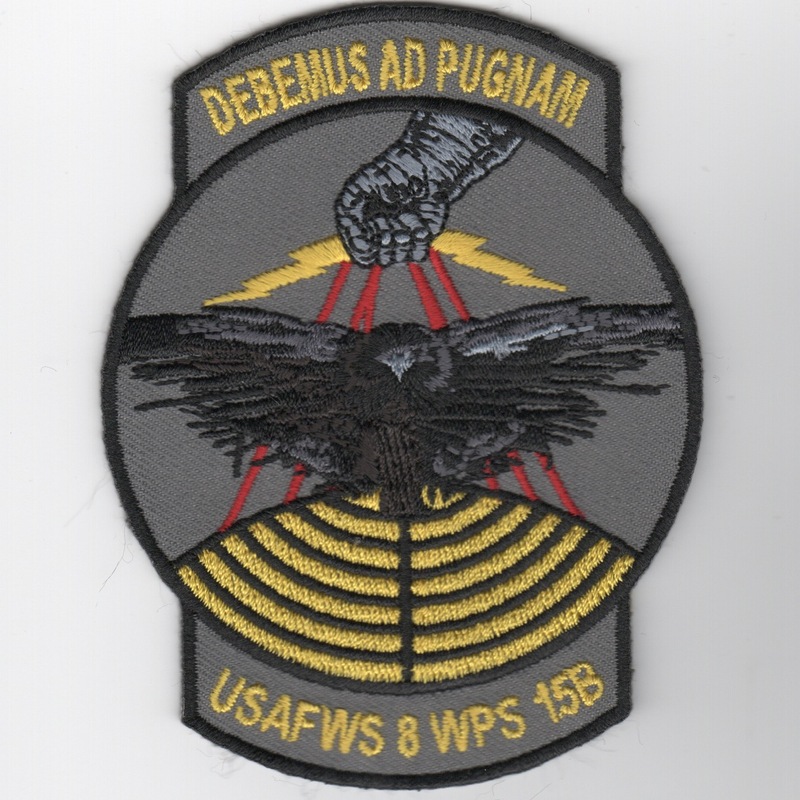 This is the class patch for the 8-15A class from the US Air Force Weapons School course based out of Nellis AFB, NV. 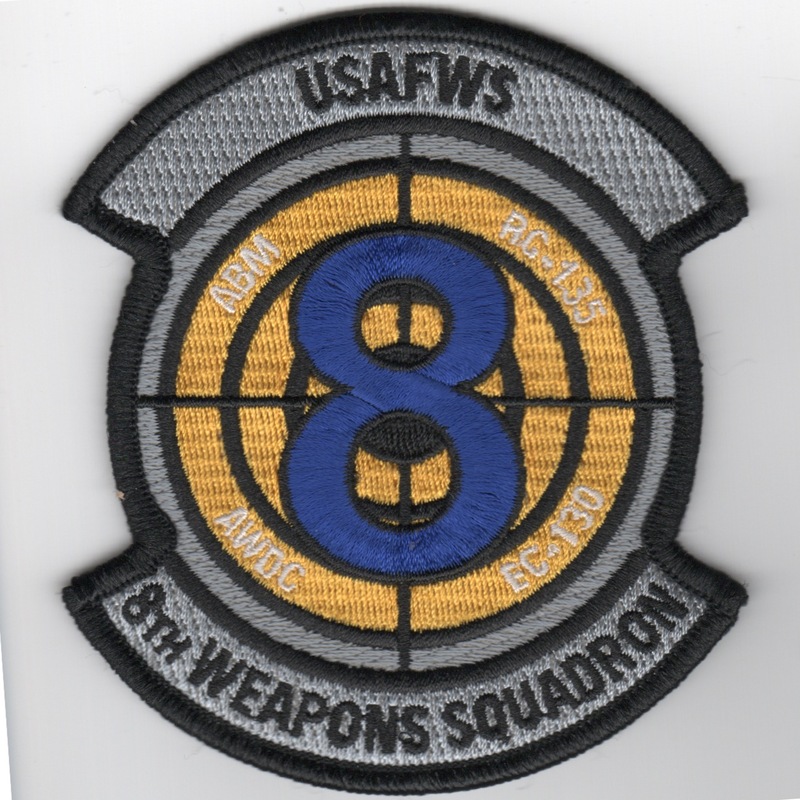 This is the class patch for the 8-15B class from the US Air Force Weapons School course based out of Nellis AFB, NV. 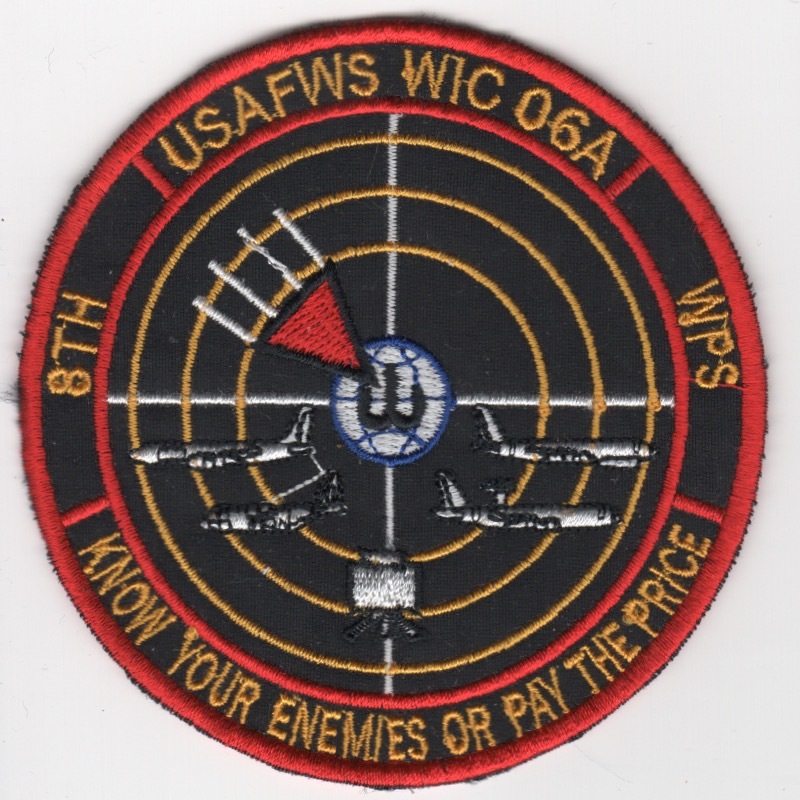 This is the class patch for the 8-16A class from the US Air Force Weapons School course based out of Nellis AFB, NV. 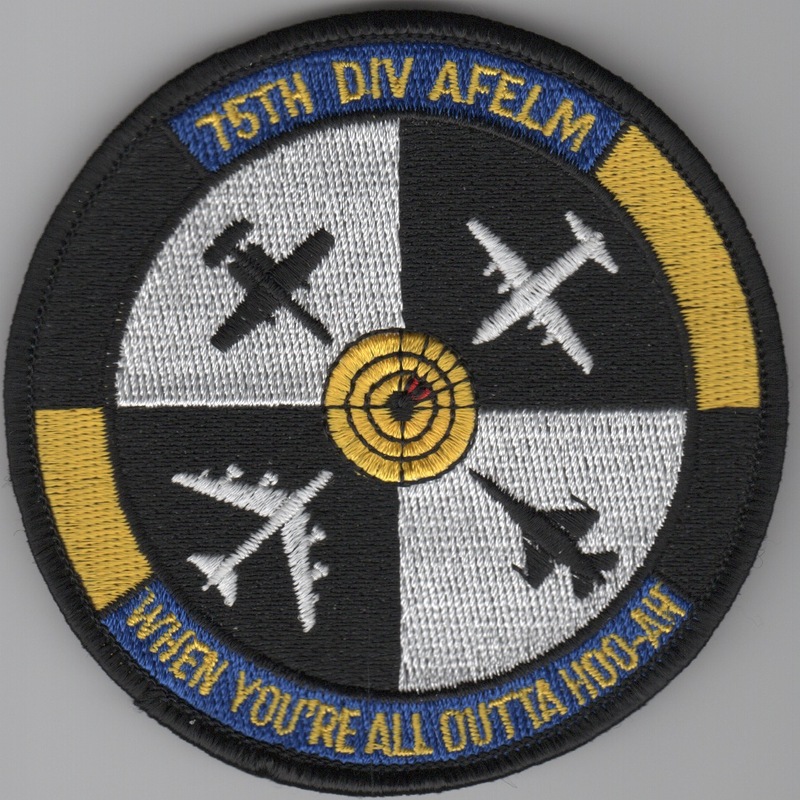 This is the aircraft patch for the 75th Division of AFELM (Air Force Elements). 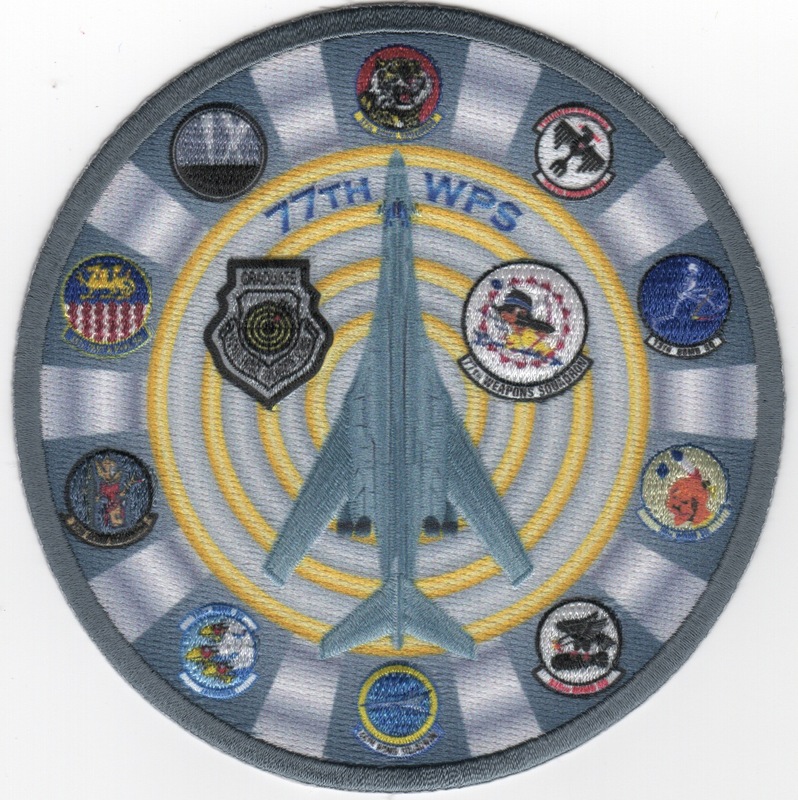 This patch shows multiple USAF aircraft on it with the WIC "Bullseye" in the center. It states "WHEN YOU'RE ALL OUTTA HOO-AH" along the bottom. 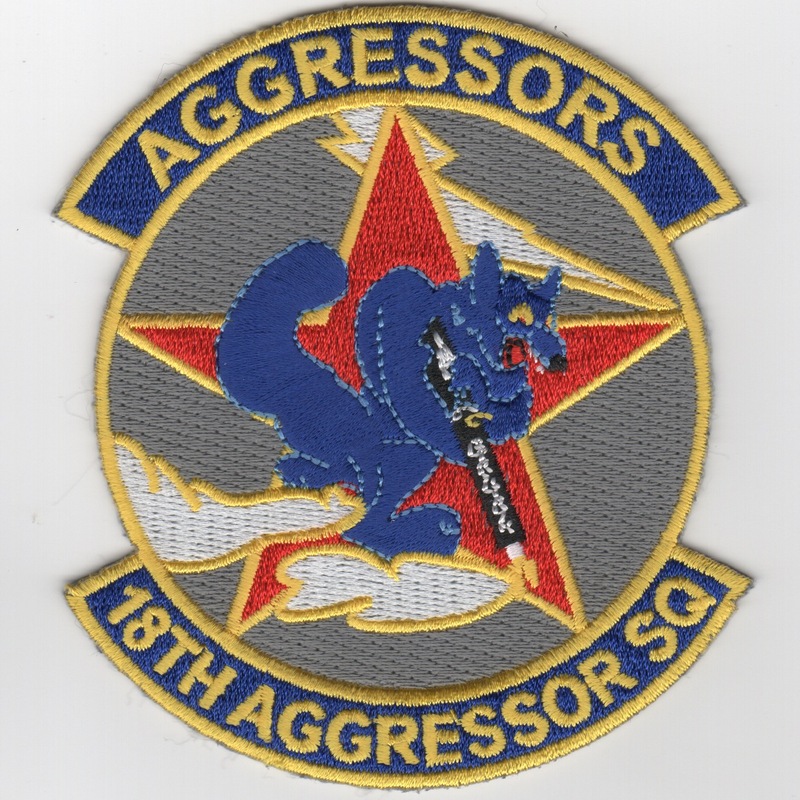 This is the English version of the squadron patch for the 18th Aggressor squadron. They prepare the combat Air Force, joint and allied aircrews through challenging, realistic threat replication, training, test support, and academics. 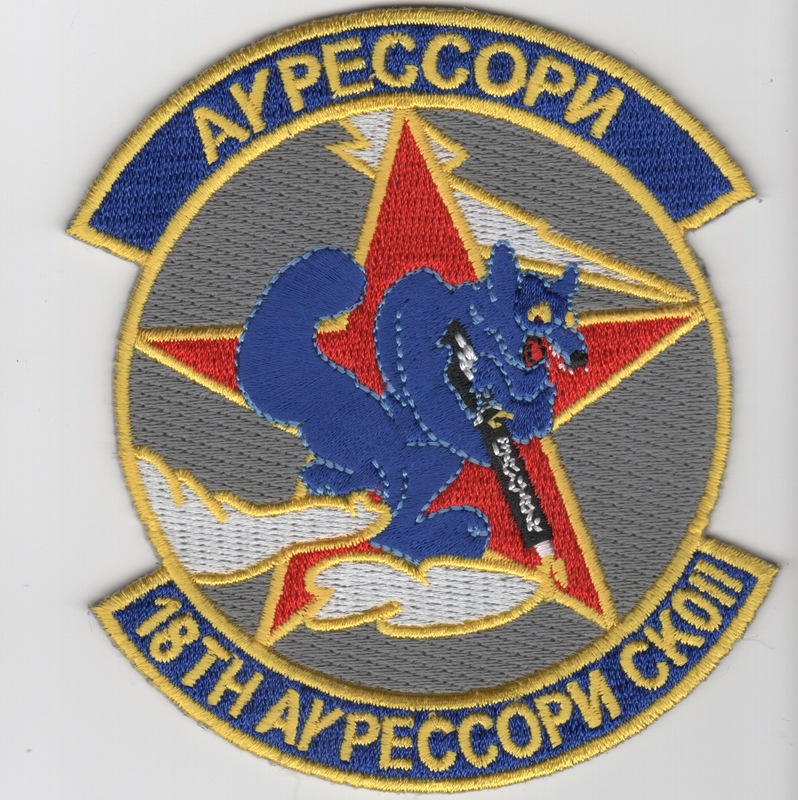 This is the Russian/Cyrilic version of the squadron patch for the 18th Aggressor squadron. They prepare the combat Air Force, joint and allied aircrews through challenging, realistic threat replication, training, test support, and academics. This is the Chinese version of the squadron patch for the 18th Aggressor squadron. They prepare the combat Air Force, joint and allied aircrews through challenging, realistic threat replication, training, test support, and academics. 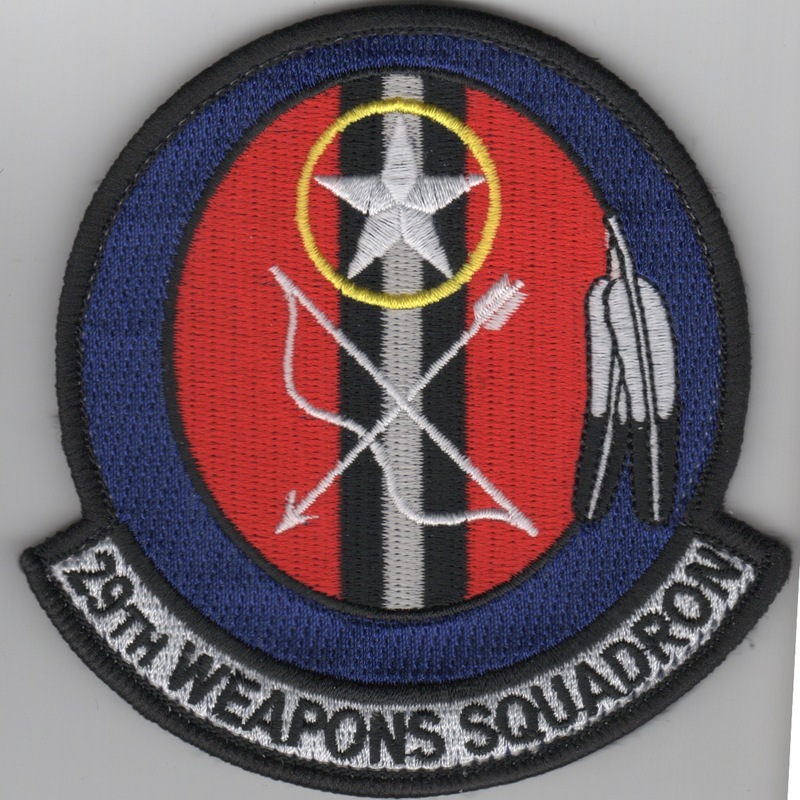 The 29th Weapons Squadron is a United States Air Force unit, stationed at Little Rock Air Force Base, Arkansas. It is assigned to the USAF Weapons School at Nellis Air Force Base. The mission of the squadron is to provide advanced Lockheed C-130J Hercules instructional flying. This is the 4" version of their squadron patch and comes with velcro already attached. This is the standard (old-style) AIM-9 "SIDEWINDER" heat-seeker missile patch. 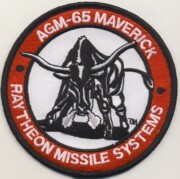 This is the Raytheon Missile Systems patch for the AIM-9 Sidewinder Missles. Cool Patch. This patch does not come with velcro attached. I am out at the moment, but have more inbound. 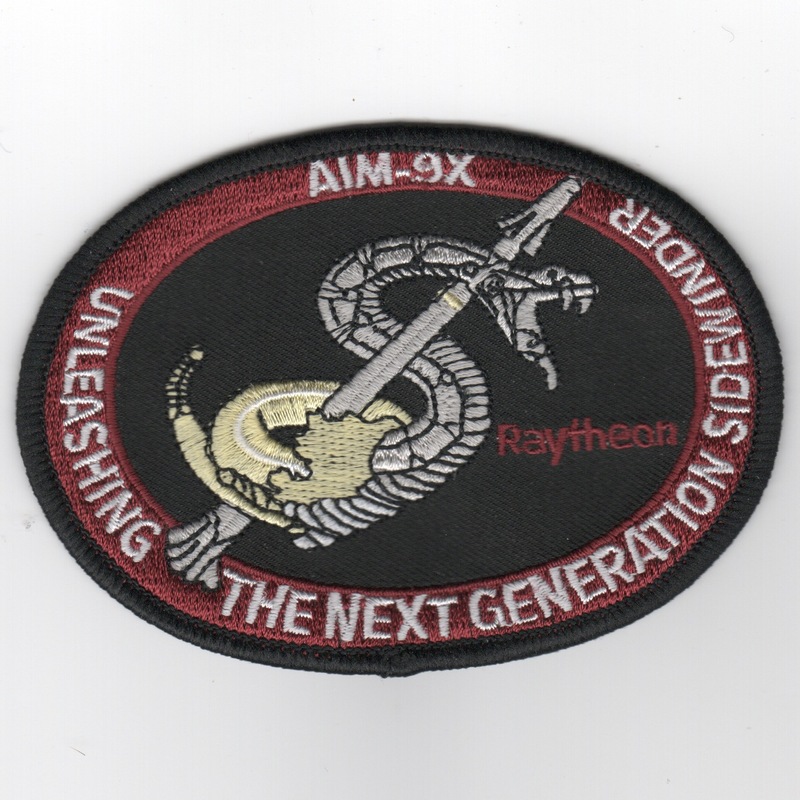 This is the Raytheon Missile Systems patch for the AIM-9X Sidewinder Missles. Cool Patch. This patch does not come with velcro attached. The AGM-65 Maverick is an air-to-ground tactical missile (AGM) designed for close air support. It is effective against a wide range of tactical targets, including armor, air defenses, ships, ground transportation, and fuel storage facilities. The AGM-65F (infrared targeting) used by the U.S. Navy has an infrared guidance system optimized for ship tracking and a larger penetrating warhead than the shaped charge warhead used by the U.S. Marine Corps and the U.S. Air Force (300 pounds/140 kilograms vs. 125 pounds/57 kilograms). The infrared TV camera enables the pilot to lock-on to targets through light fog where the conventional TV seeker's view would be just as limited as the pilot's. The AGM-65 has two types of warheads; one has a contact fuze in the nose, and the other has a heavyweight warhead with a delayed fuze, which penetrates the target with its kinetic energy before detonating. The latter is most effective against large, hard targets. The propulsion system for both types is a solid-fuel rocket motor behind the warhead. The Maverick missile is unable to lock onto targets on its own; it has to be given input by the pilot or Weapon Systems Officer (WSO). In an A-10, for example, the video feed from the seeker head is relayed to a screen in the cockpit, where the pilot can check the locked target of the missile before launch. A crosshair on the head-up display (HUD) is shifted by the pilot to set the approximate target while the missile will then automatically recognize and lock on to the target. Once the missile is launched, it requires no further assistance from the launch vehicle and tracks its target automatically. This makes it a fire-and-forget weapon. This patch does not come with Velcro attached. This is the AIM-120 Advanced Medium Range Air-to-Air Missile (AMRAAM) radar missile patch.